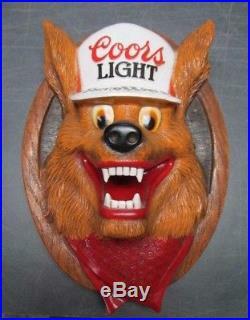 HILARIOUS and rare 1980s Coors Light Beer Wolf 3-D Wall Mounted Plastic Head. Measures roughly 14" long by 10" wide and 6 deep. Looks like he's coming right toward you when you stand in front of him. Seems like all the beer companies had their animal sidekicks in the 80s. The beer wolf was short lived, but very collectible! This one has nice bright colors with no fading. Decorate your mane-cave or home bar with a little canine companionship! The item "RARE VINTAGE COORS LIGHT BEER WOLF HEAD WALL MOUNTED 3D PLASTIC HEAD PLAQUE" is in sale since Wednesday, November 29, 2017. 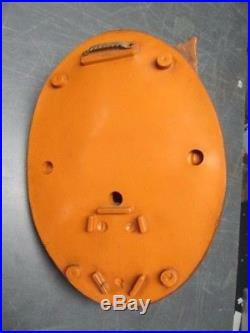 This item is in the category "Collectibles\Breweriana, Beer\Signs & Tins\Coors". The seller is "goinpostalme" and is located in Norway, Maine. This item can be shipped to United States, Canada, United Kingdom, Denmark, Romania, Slovakia, Bulgaria, Czech republic, Finland, Hungary, Latvia, Lithuania, Malta, Estonia, Australia, Greece, Portugal, Cyprus, Slovenia, Japan, China, Sweden, South Korea, Indonesia, Taiwan, Thailand, Belgium, France, Hong Kong, Ireland, Netherlands, Poland, Spain, Italy, Germany, Austria, Russian federation, Israel, Mexico, New Zealand, Singapore, Switzerland, Norway, Ukraine, United arab emirates, Qatar, Kuwait, Bahrain, Croatia, Malaysia, Chile, Colombia, Costa rica, Dominican republic, Panama, Trinidad and tobago, Guatemala, Honduras, Jamaica.